It&apos;s never too late to say I&apos;m sorry. While Halo 4 , at least for me, will be permanently time-stamped as 343 Industries' somewhat clumsy, less-than-effective continuation of Bungie’s FPS epic, I’ll not hold a grudge. Like I said in my review, there’s great potential, or rather potential for greatness, for this trilogy if the company listens to the fans while also stretching their threshold of acceptance the way only truly engaging works of art can. The stuttered misstep that was Halo 4 , however, does require an apology before all parties involved may move on. Halo 4 was liked a mispronounced name exchanged in the initial first face-to-face greeting between parties who had formerly only corresponded via email. The intent was pure, but there was a certain personal, albeit unintentional, offense in the lack of effort in translation. 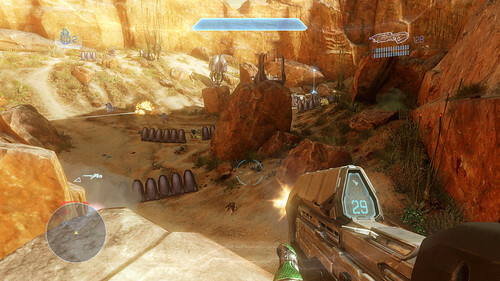 Specifically, the main campaign felt too short, and what time the players could spend in Master Chief’s boots was unrewarding; the only real sense of sympathy in Halo 4 for the characters with which fans had grown to empathize via the original trilogy came a la cutscenes, the length of which made the experience much less interactive than gaming should ever be. There was a bold plan for providing additional content to broaden the scope of Halo’s reach (pun oh so intended), and that took the form of Spartan Ops. Spartan Ops puts players, by themselves or with friends/strangers, inside the helmet of a Spartan IV on Fireteam Crimson six months after the end of the events in Halo 4 . Aside from the opportunity to shoot more Covenant and Prometheans, each weekly episode, comprising five missions, offers an approximately five-minute movie that contextualizes the action. While the additional content was welcomed by those lamenting the brevity of the Halo 4’s main campaign, and the co-op arena battle style suited those who enjoy the daily grind of leveling up and showing off stats, all that the first five Spartan Ops episodes offered to counter Halo 4’s shortcomings was more of the same: alienating cutscenes (now totally separated from the battle) and monotonous, menial objective-based, seemingly inconsequential battle. Like chewing gum to assuage hunger, playing through each installment just grew the fan base’s collective stomach growl for substance. Then something unexpected happened; 343 heard the fans’ rumbling stomachs and, instead of just lending an apathetic ear or trying to justify their low-calorie content in argument, actually made some changes. Starting with episode six, the repetitious reuse of maps stops. Also, each map in each mission feels more like a level in the main campaign; there is more story-related and goofball com banter as well as more corridors and structures instead of open-area arenas. And even though the waves of enemy hordes still make each mission easily identifiable as a survival round, the writing and situations are such that the flow of each scenario seems more fluid and less task-oriented. There are still shortcomings if playing solo, namely spawn points either too far away from the action or smack-dab in the middle of the 30 foes programmed with unrelenting grudges and wicked weapons. Needless to say, team play is not only the sanest option but also highly recommended. With regard to story, Spartan Ops episodes, since and including number six, have consistently delivered characters and scenarios with surprising depth given each episode’s movie’s runtime. The last few installments have even brought me to the edge of my seat. Hell, there was even a moment when I sighed “oh thank god” out loud, because I had skipped a week and the next episode was already available; cliffhanger anxiety instantly nullified. There’s still a serious sense of disconnect between cinematic and gameplay, a rift enhanced by the story not being woven or even chopped up and delivered piecemeal throughout the episodes but rather delivered as a one-shot intro completely outside of the action. These episodes do leverage banter better though, which helps to flesh out characters and atmosphere between missions. The important thing to take from all of this is that 343 has made its apology and, more importantly, backed it up with some pretty damned impressive revamps. If this amount of consideration and ingenuity continues into Halo 5, I think 343 will have successfully reassured and re-energized its base. In kind, I’ll retract what was my hesitantly issued “Recommended” rating from the Halo 4 review and make it a whole-hearted “Recommended” based on what was promised, what was delivered, what was added, and what it all means: that the transplant was a success, and there’s a lot of heart behind this enterprise.